Spring and fall are some of the busiest seasons for farm equipment on the road, so gear up for a safe, attentive year on the roads. Rural roads pose special dangers with curves, two-way traffic, slow-moving farm vehicles, wildlife, narrow lanes, and more. Whenever you hit the road with your machinery for field-work, check on your equipment and roadway habits to reduce the risk of a roadway incident. Is your equipment labeled with slow moving vehicle (SMV) emblems, that are in good condition? Are all of your lights fully functioning and visible? Do you perform pre-travel checks? Is your equipment outlined with reflective equipment to mark the wide points? Are you keeping lights on whenever you’re on the road, including during the day? Are you trying to travel during daylight, or using only lit equipment at night? Are you always using turn signals? 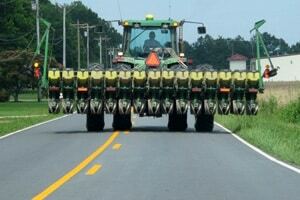 Are your employees trained for farm equipment safety on public roads? Are you keeping an eye on cars behind you? It may be helpful to pull over for cars to pass when it’s safe.